A landslide on the outer flanks of Tolimán volcano passed through and buried portions of a mountain village at 0418 on 23 April. Regional authorities blamed steep slopes, wet soils, and minor tremors. The disaster struck the village of Chichicaste, which lies along the volcanic front ~300 km W of the capital, Guatemala City. Tolimán and the area stricken sit on the S side of Lake Atitlán, the 18 x 12 km lake filling the depression of Guatemala's famous Atitlán caldera. As of the afternoon of 23 April, the Guatemalan agency CONRED reported 200 people evacuated, 20 missing, and 6 confirmed dead. Known damage to infrastructure included 40 homes at risk, another 12 with severe damage, and 6 destroyed. The village and environs had been specifically mentioned as vulnerable to landslide hazards in a government report issued in September 2002 following a similar disaster then. Mudslides in highland areas are common during the wet season, an interval that often occurs during late March through September. The Global Volcanism Program has no Bulletin Reports available for Tolimán. Volcán Tolimán is a large andesitic stratovolcano that rises above the S shore of Lake Atitlán. Tolimán was constructed within the Pleistocene Atitlán III caldera, near its inferred southern margin. A shallow elliptical crater truncates the summit, and a minor subsidiary peak to the SSW also has a shallow crater. In contrast to the tephra-covered surface of its twin volcano to the S, Volcán Atitlán, the surface is draped by prominent thick lava flows. Many of the flows were erupted from vents on the flanks and form a highly irregular shoreline on the S side of Lake Atitlán. No historical eruptions are known. However, a lava flow that entered Lake Atitlán from the parasitic lava dome of Cerro de Oro on the N flank was considered by Newhall et al. (1987) to be less than a few thousand years old based on the thickness of sediment accumulated on the sublacustral part of the flow. Halsor S, Rose W I, 1991. Mineralogical relations and magma mixing in calc-alkaline andesites from Lake Atitlan, Guatemala. Mineral Petr, 45: 47-67. Newhall C G, Paull C K, Bradbury J P, Higuera-Gundy A, Poppe L J, Self S, Bonar Sharpless N, Ziagos J, 1987. Recent geologic history of Lake Atitlan, a caldera lake in western Guatemala. J. Volcanol. Geotherm. Res., 33: 81-107. Penfield G T, Rose W I, Halsor S, 1986. Geology of the Lake Atitlan volcanoes. Geol Soc Amer Map and Chart Ser, 55 1:49,212 scale map. Rose W I, Penfield G T, Drexler J W, Larson P B, 1980. Geochemistry of the andesite flank lavas of three composite cones within the Atitlan Cauldron, Guatemala. Bull Volcanol, 43: 131-154. The Global Volcanism Program is not aware of any Holocene eruptions from Tolimán. 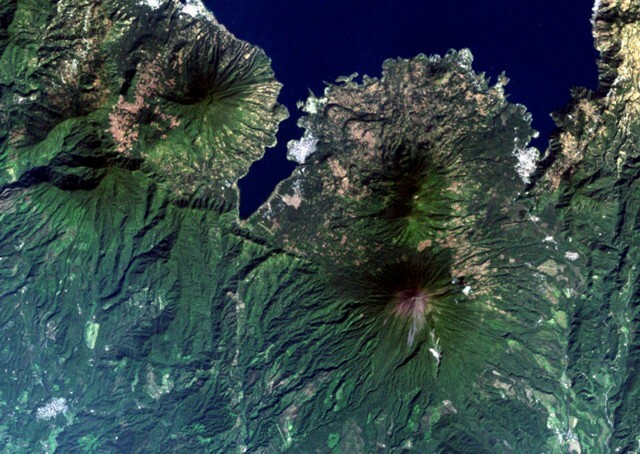 If this volcano has had large eruptions (VEI >= 4) prior to 10,000 years ago, information might be found on the Tolimán page in the LaMEVE (Large Magnitude Explosive Volcanic Eruptions) database, a part of the Volcano Global Risk Identification and Analysis Project (VOGRIPA). There is no Deformation History data available for Tolimán. There is no Emissions History data available for Tolimán. 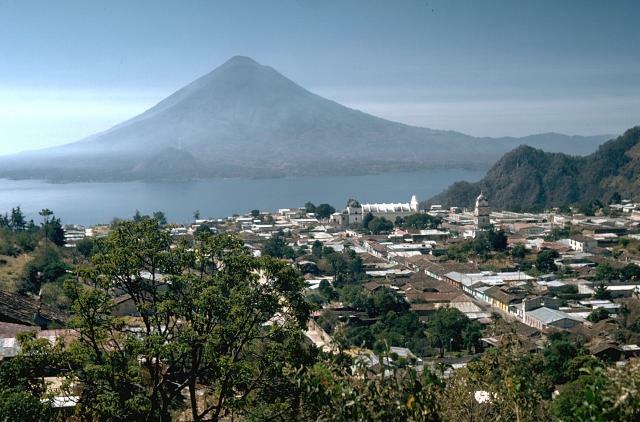 The paired Atitlán-Tolimán volcanoes rise above Lake Atitlán in this view from the town of Solola north of the lake. Atitlán, Tolimán's higher twin volcano, forms the skyline immediately behind and to the left of Tolimán. Cerro de Oro, a flank lava dome, seen here immediately above the lakeshore left of the summit, erupted within the past few thousand years. The two volcanoes were constructed over the buried rims of two Miocene-Pleistocene Atitlán calderas. Three major post-caldera stratovolcanoes fill the southern half of Atitlán caldera in this view from the NE. 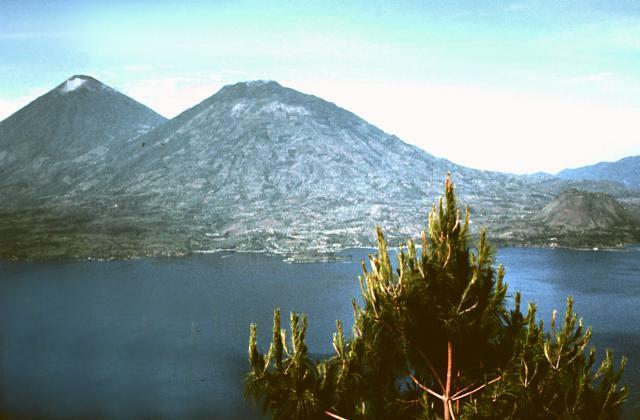 Atitlán caldera was formed during three major explosive eruptions from the Miocene to late Pleistocene. 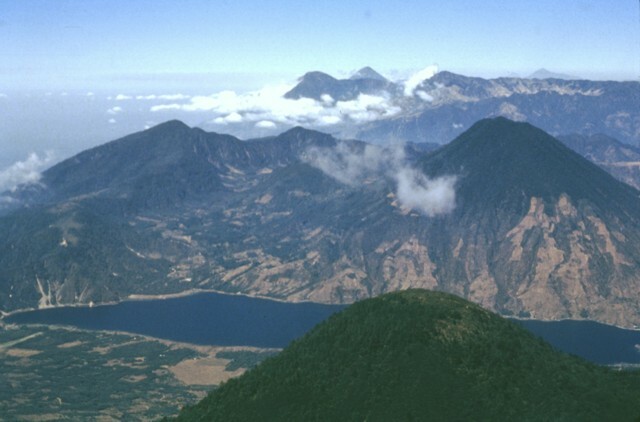 Conical Atitlán volcano (upper left) was constructed above the southern rim of the youngest caldera, Atitlán III, whose low southern rim is visible on the center horizon beyond narrow Santiago bay. Tolimán (right of Atitlán) and San Pedro (upper right) overlie the rim of Atitlán II. The buried rim of Atitlán I lies below the shoreline of Tolimán. 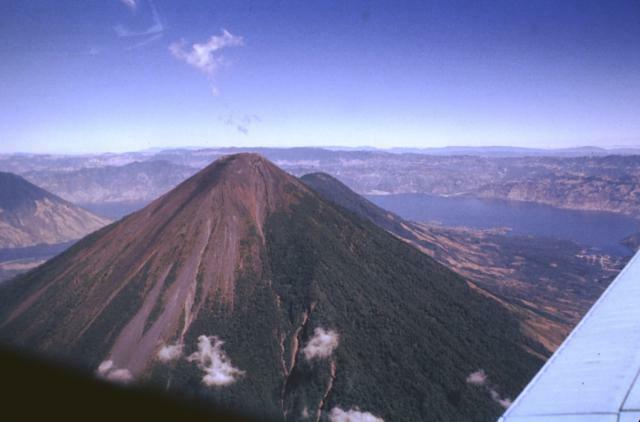 The rounded peak in the foreground is the southernmost of the twin summit peaks of Tolimán volcano. 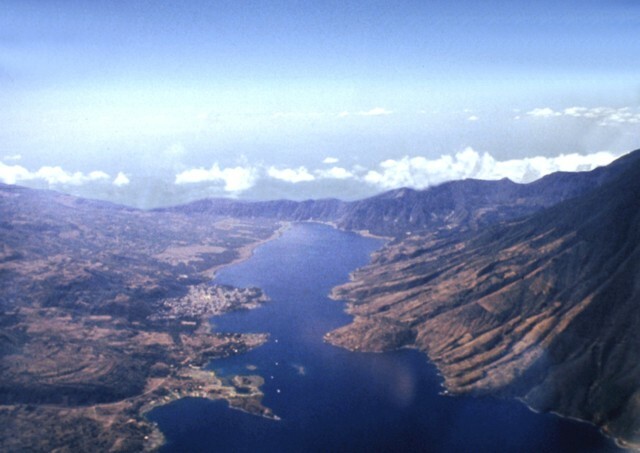 The older post-caldera volcano of Atitlán caldera, San Pedro, lies across Santiago Bay at the right. On the center horizon are the peaks of Santo Tomás (left) and Santa María (right). Tajumulco volcano, Central America's highest, is the peak on the far right horizon. The Guatemalan volcanic front rises more than 3500 m above the hazy Pacific coastal plain at the upper left. Volcán Tolimán (center) towers above the south shore of scenic Lake Atitlán. Tolimán and its conical twin volcano Atitlán (upper left) were constructed within the Pleistocene Atitlán III caldera, near its inferred southern margin. In contrast to the tephra-covered surface of Volcán Atitlán, the surface of Tolimán is draped by prominent thick lava flows. The recent history of Tolimán is dominated by effusive eruptions from flank vents. The resulting lava flows extend into the lake and produce a highly irregular shoreline. Conical Volcán Atitlán directly overlies the inferred margin of the Pleistocene Atitlán III caldera, whose northern rim lies across Lake Atitlán. Atitlán volcano forms a paired volcano with Tolimán to its north (seen just to the right of Atitlán's summit). The historically active Atitlán is younger than Tolimán, although their earlier activity overlapped. In contrast to Tolimán, Atitlán displays a thick pyroclastic cover, reflecting its predominantly explosive eruptions that have been recorded since the 15th century. Scenic Lake Atitlán fills the northern half of the Atitlán III caldera, which formed about 84,000 years ago following eruption of the Los Chocoyos Ash. 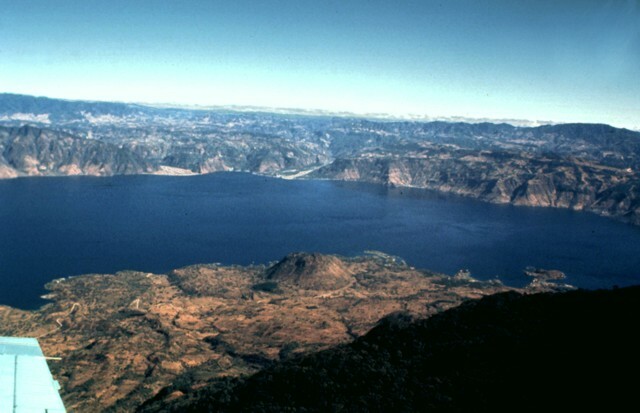 The 18 x 12 km caldera lake is seen here from the south, with the slopes of the post-caldera Tolimán stratovolcano in the foreground. The relatively flat lake floor is 300 m below the water surface, and caldera walls rise to nearly 900 m above the lake. Bathymetric surveys revealed no evidence for resurgent doming or post-caldera vents beneath the lake surface. 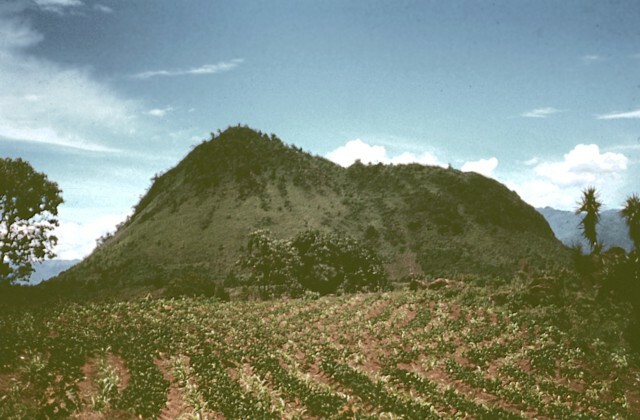 Cerro de Oro, a 200-m-high lava dome, was constructed on the northern flank of Tolimán volcano near the southern shoreline of Lake Atitlán. Lava flows from Cerro de Oro extend into the lake and may be as young as a few thousand years. The dome's name (which means Hill of Gold) reflects local belief that it contains buried treasure. The linear Santiago Bay in Lake Atitlán is the result of encroachment by the flanks of three post-caldera volcanoes into Lake Atitlán. The narrow channel extends about 8 km to the low southern caldera wall on the center horizon and is about 1 km wide. At the right are the slopes of San Pedro, the oldest of the post-caldera stratovolcanoes. 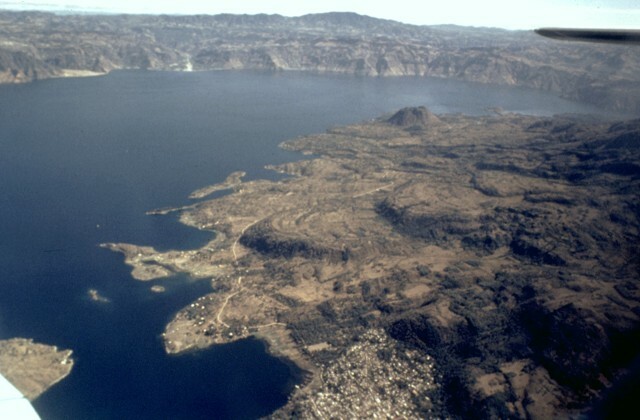 Contrasting eruptive styles produced the irregular shoreline in the left foreground consisting of lava flows from Tolimán and the smoother shoreline at the far left, formed by pyroclastic deposits from Atitlán volcano. Youthful lobate lava flows from Tolimán volcano form an irregular shore jutting into Lake Atitlán. The satellitic cone of Cerro de Oro is on the near shore at the upper right, and the NE wall of Atitlán caldera rises nearly 900 m above the far side of the lake. The town of Santiago Atitlán (lower center) lies near the mouth of Santiago Bay. The buried margin of Atitlán I caldera, the first of three Miocene-Pleistocene calderas at Atitlán, lies approximately below Cerro de Oro; the boundary of Atitlán II caldera lies just below the bottom of the photo. The twin peaks of Tolimán volcano rise only 4 km away beyond the block-littered summit of Atitlán volcano. Atitlán volcano was constructed over the approximate margin of the Atitlán III caldera, whereas Tolimán was built over the margin of Atitlán II caldera. The irregular shoreline at the left is formed by lava flows from Tolimán. The far wall of Atitlán III caldera can be faintly seen across Lake Atitlán. 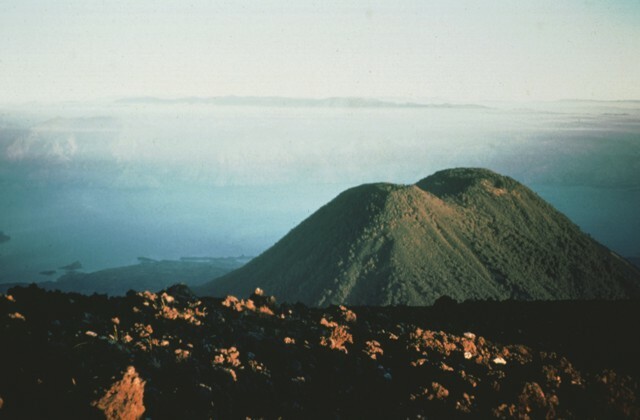 The two post-caldera cones have dramatically different eruptive styles, with lava flows dominating at Tolimán and pyroclastic eruptions at Atitlán. Photo by Bill Rose, 1983 (Michigan Technological University). 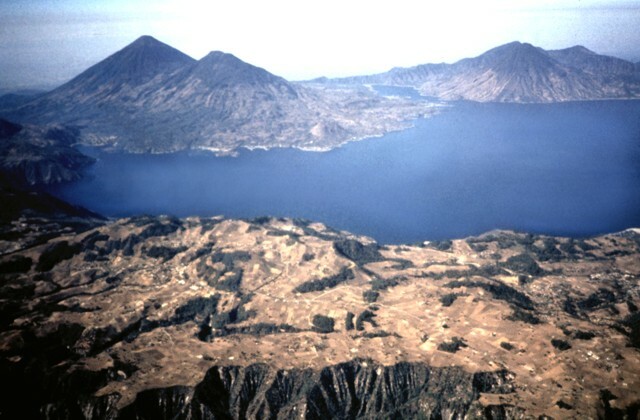 The 6-km-long, dagger-like Santiago Bay on Lake Atitlán is constrained by lava flows from San Pedro (upper left) and Tolimán (right-center) volcanoes. Young lava flows entering the lake, in particular those from Tolimán, have created a very irregular shoreline. The unvegetated summit of Atitlán volcano, the youngest post-caldera stratovolcano, lies south of Tolimán. Part of the southern margin of the Atitlán III caldera, which lies below the summit of Atitlán volcano, is offset along faults just south of the tip of Santiago Bay. There are no samples for Tolimán in the Smithsonian's NMNH Department of Mineral Sciences Rock and Ore collection. Large Eruptions of Tolimán Information about large Quaternary eruptions (VEI >= 4) is cataloged in the Large Magnitude Explosive Volcanic Eruptions (LaMEVE) database of the Volcano Global Risk Identification and Analysis Project (VOGRIPA).